Simple and wholesome are the two best words to describe Kenyan cuisine, but don’t be fooled for one minute into thinking that means the cuisine is bland or boring. There is no national Kenya dish as such and food varies massively across the country, but one thing remains true wherever you’re eating in Kenya – the food is guaranteed to be fresh and delicious, cooked with just enough seasonings to enhance the flavour but not so much as to mask the true taste of the fish, meat or vegetables. Locals in rural locations put whatever seasonal ingredients they can get their hands on to very good use, creating honest, nutritious and hearty meals during the process. Since most people who live in this part of the country work in agriculture, food needs to be filling and provide them with enough energy to get through a full day of hard work. This is why the majority of rural dishes are made up of energy-providing starchy grains, such as maize. 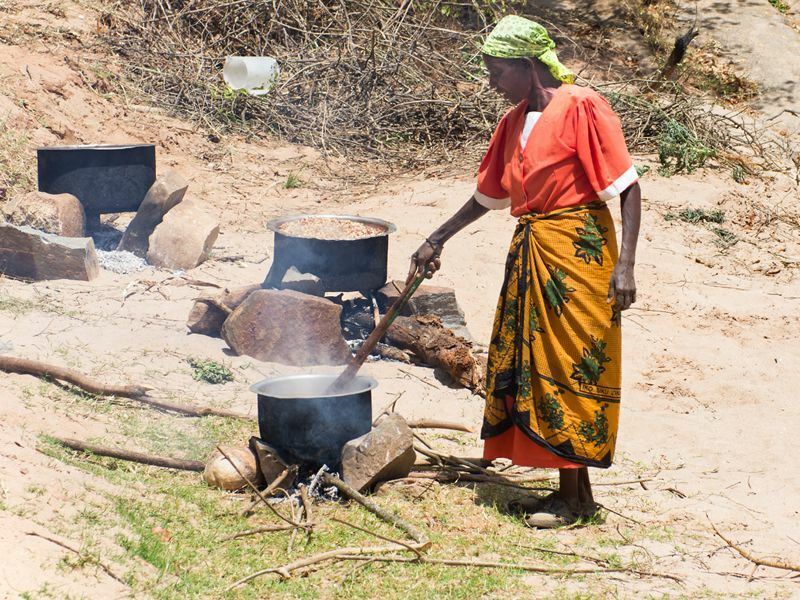 In rural parts of Kenya, most meals are vegetarian, but meat – usually roasted goat meat or beef – is served on special occasions, such as for religious ceremonies. In coastal areas, fish and seafood make up a large part of the diet, since these ingredients are available in abundance from lakes and the sea. Mangrove mud crabs are also harvested along the coastline and appear in a variety of traditional stews. Meals in this part of the country often pack more flavour than those inland, thanks to the use of Arabic and South Asian spices. This is because the coast of Kenya was more influenced by colonisation and merchant travellers (and subsequently the ingredients and recipes they brought with them) than the inland towns and villages. Cattle herding has a long history in Kenya which dates back to around 1,000AD when Hima – a clan from North Africa – introduced the rewarding pastime to the natives. Keeping cattle allowed the locals to produce enough meat, milk, butter and blood to easily feed the whole village – something which still stands true today. When the Portuguese landed on the coast of Kenya in the late 1400's, they brought with them the food they had just discovered during their trip to Brazil, mainly maize, pineapples, bananas, peppers, chillies, sweet potatoes and cassava. The locals took to these new ingredients well, with most of them quickly becoming strong staples used in everyday cooking. The Portuguese also introduced oranges, limes and lemons they’d sourced from India and China, as well as pigs, but these new additions didn’t catch on as well. In the mid-1800's, European explorers came upon Mount Kilimanjaro and Mount Kenya and shortly after, they developed an interest in the natural recourses of East Africa. As Britain slowly increased its domain, the potatoes, cucumbers and tomatoes they brought with them began to be farmed throughout the country and incorporated into traditional Kenyan dishes to create more flavourful and nutritious recipes. The one influence which stands out from the others due to its strength and its ability to spread is without a doubt India. In the 19th century, the British imported thousands of Indian workers to Kenya to build a railway network. But the workers didn’t come empty handed – they brought with them the spices, cooking methods and recipes from home. This is why chapatis, samosas, chai tea, chutneys, curries and seasonings made up of a plethora of Indian spices – such as cumin, turmeric, ginger and coriander – are found throughout Kenya today. Leafy green vegetables – like cassava leaves, sweet potato leaves, pumpkin leaves and ‘Sukuma Wiki’ leaves, similar to collard greens – are the most common vegetables found in Kenya because they’re easy to grow throughout the year in dry conditions. These leaves are usually sautéed in oil or stirred into soups to add color, flavour and nutrition. They’re also an effective way to pad out dishes when other ingredients are scarce. Meat doesn’t play an important role in Kenyan cuisine – in fact, you’ll find that most Kenyan dishes are entirely vegetarian. However, when meat does feature in a recipe, it’s usually in the form of beef or goat meat, which are the two animals most commonly farmed across the country. Meat is usually cooked plain on the bone over a barbecue with nothing to season it but a sprinkling of salt or de-boned, cubed and cooked alongside seasonal vegetables and water or coconut milk to make a flavourful stew. Villages and towns along the Indian Ocean and around Lake Victoria and Lake Turkana feast on fish more often than locals inland enjoy meat. Freshly caught fish is available all-year-round, with tilapia and Nile perch being the most common types caught in the lakes. However, due to the recent over-fishing at the lakes, fish is starting to become less common in villages around these areas. When it is eaten, fish is most commonly fried whole for crispy skin and perfectly-cooked flesh or sliced in half and cooked on a barbecue for a crunchy outside and smoky flavour. 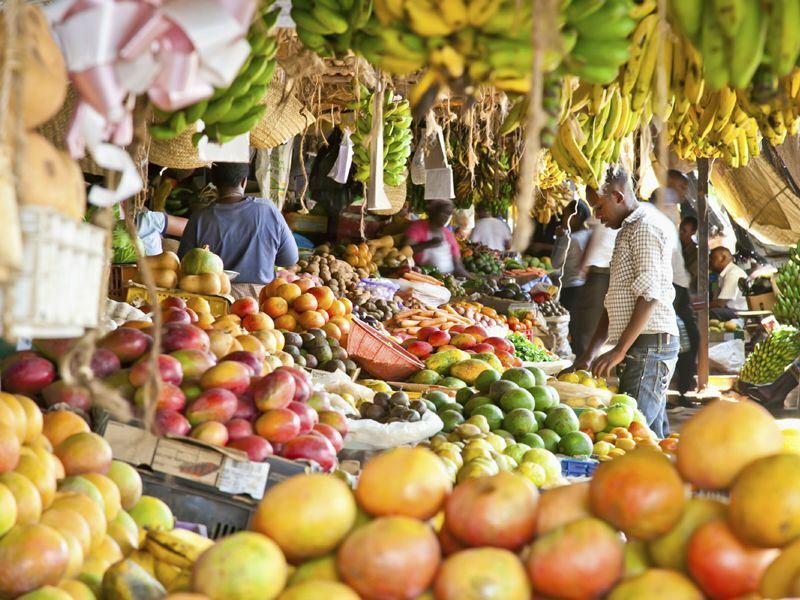 Although fruits in Kenya are seasonal, there are always several types of fruits available at any one time in the country. Passion fruits, mangoes, pineapples, oranges, bananas, pears and papaws are the most popular fruits which are often sliced and served up for breakfast. Fruit is also served for dessert in the form of fresh fruit salads and mousse-like puddings when it’s cooked with coconut milk. Along with coffee, tea is the most popular hot drink in Kenya. Known locally as ‘Chai’, the local tea is brewed dark, sweetened with a lot of sugar and mixed with a generous amount of whole-fat milk. During the brewing process, a combination of Indian spices, such as cinnamon, ginger, cardamom, nutmeg and cloves are added, creating layers upon layers of intense flavour with every sip. Sukuma Wiki is the closest thing you’ll find in Kenya to a national dish, made from onion, collard greens and tomato cooked in water or stock. How the dish is flavoured really depends on where you are in the country – in some parts its served as it is with just a sprinkling of salt and pepper and in some places which were colonised by India, it’s favoured with peanut oil, cumin, coriander and turmeric. Ugali is the staple food of Kenya which is eaten as an accompaniment to all kinds of meat, fish and vegetable dishes. This starchy dish is made from cornmeal, millet flour or sorghum flour (or a combination of two or three) cooked with water until it forms a dough-like consistency. The most common way to eat Ugali is to roll a lump of it into a ball which you then dip into a sauce or stew. You can also make an indent into the ball and use it as a scoop or flatten it out and then wrap it around pieces of meat, fish or vegetables, just like a flat bread. After Ugali, Irio is the most common staple dish in Kenya which originated in Kikuyu but quickly spread throughout the country because it’s cheap to make, easy to prepare and filling to eat. To make Irio, simply boil potatoes and green peas until soft, drain off the excess water and mash them up together. Individual corn kernels are then stirred in to add some color and texture. Whilst Irio can be used as a side dish for any stew, fish or meat, it’s most often served alongside Nyama Choma. At its most basic, Nyama Choma is barbecued meat, but really, it’s so much more than that. Goat and beef are the two types of meat which usually make up Nyama Choma but it can also be made from chicken (in which case it’s called Kuku Choma) or fish (Samaki Choma). You won’t find any barbecue sauces or honey glazes with Nyama Choma. To make this incredible dish, the meat is taken on the bone and simply cooked as it is on the barbecue with, at most, a sprinkling of salt. The result is far from boring – when cooked this way, the flavour of the meat really shines through and every bite is worth savouring. Maharagwe is a flavour-packed curry-like dish usually served with Ugali, chapatis or plain boiled rice. It’s made by sautéing garlic, onion and chillies together in a hot pan before adding kidney beans, tomatoes, curry powder and coconut and simmering until all the flavours infuse and the curry thickens. The ingredients are kept fairly simple, so you won’t be overloaded with spice after spice – just treated to a few exotic hints of flavour here and there. Mutura is a delicious protein-packed sausage which serves as a great way of ensuring all the odds and ends of an animal are used to their full potential. Goat intestines form the sausage casing which is stuffed with a mixture of ground meat held together with goats’ blood. The sausage is boiled in water until it’s partly cooked, then finished on a flaming barbecue which dehydrates the sausage and adds a sensational smoky flavour. 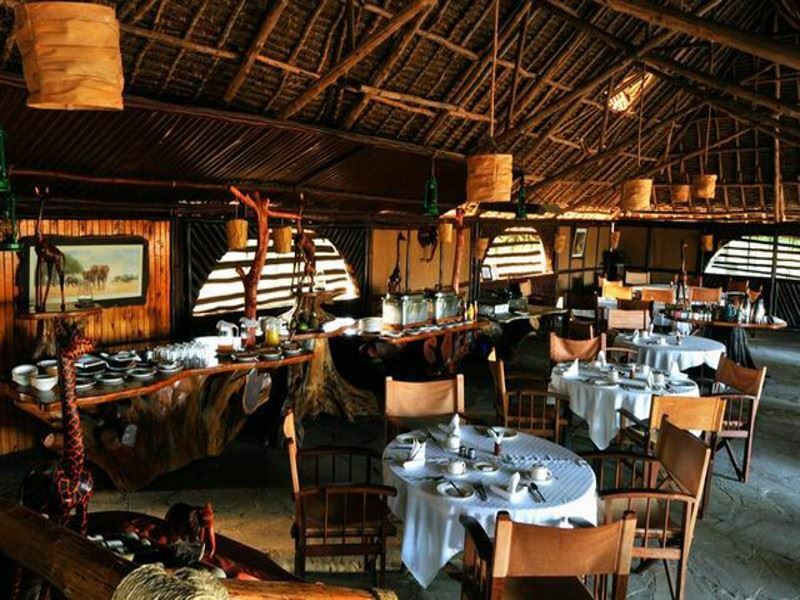 The food served at safari camps and game lodges in Kenya is greatly varied, with an eclectic selection of international dishes as well as traditional favourites the locals love. Since most of the Kenyan dishes on offer will be made from fresh produce grown locally onsite (in terms of fruit and vegetables) or sourced from local farmers (in terms of meat and poultry) it’s definitely worth trying the typical cuisine – not matter how unsure you’re feeling! If you visit any safari camps or game lodges by the sea, it’s an absolute must to try the fish and seafood offered, as it will likely have been freshly caught that very morning. Some things to keep in mind are that the food you’ll enjoy at safari camps and game lodges will certainly be seasonal and in summer, some fresh fruits and vegetables will be tough to get a hold of. But don’t worry – you’ll never have to go without – a tasty alternative will always be available if circumstances change. Sukuma Wiki is one of the most popular and commonly eaten dishes in the country, mainly due to its simplicity and affordability. The Swahili phrase translates into English as “stretch the week”, meaning that this type of dish was used as a filler to pad out other dishes or replace them altogether when richer, more expensive food was scarce. The collard greens which comprise most of this dish are grown in practically every family garden in Kenya and are a great way of stretching even the most frugal diets into filling ones. This recipe takes 5 minutes to prep, 30 minutes to cook and feeds 2-3 people as a side dish.